The Land Potential-Knowledge System (LandPKS; landpotential.org), a joint USAID-USDA program, was created to help put valuable information about the land, including climate, soils, and vegetation, in the hands of land managers across the world. It does this through the use of the LandPKS Mobile app, which is free to download and use for both Android and iPhone. Importantly, LandPKS is a way to both input and access data that is point-based and geo-referenced. The LandInfo module is one component of the LandPKS app and allows the user to obtain information about the soil directly beneath their feet. The LandInfo module walks a user through digging a hole and hand-texturing the soil to determine the soil texture and available water holding capacity or AWC. Future versions of LandInfo will also include infiltration rates, organic matter, soil color, and have algorithms that match the user-input data about soil texture with global soil maps to provide the user with the specific name of their soil. The point-based model used by LandPKS is incredibly powerful because in many parts of the world the soil varies significantly from place to place and these changes in soil types can have dramatic impacts for farmers and others aiming to utilize that land. One excellent example is from the village of Nyamihuu, located near Iringa, Tanzania (photo below). 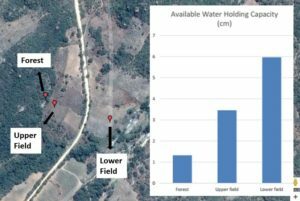 LandPKS plots dug in three sites in Nyamihuu, Tanzania (Lower Field, Upper Field, and Forest), and the LandPKS results for Available Water Holding Capacity for each location. With local farmers, the LandPKS team dug three LandInfo Plots within a short distance from each other on a slightly sloping landscape. The differences in soil texture and AWC were quite drastic, with the Lower Field having almost double the AWC of the Upper Field. This has serious implications for farmers because the Lower Field will be generally more productive due to the greater ability to hold water in the soil for crops to utilize. Further, the Forest plot had by far the lowest AWC, which is important because it suggests that clearing the forest for cultivation may not be worth the effort and environmental impact. The lesson here is that location matters! Soil can vary from one farm to the next, and LandPKS can empower farmers, agricultural extension agents, and others to gain access to site-specific soil information. Knowing your soil texture and AWC can influence what decisions are made. First, it can help a land manager decide if they want to farm a piece of land or not. As the example of the Forest plot above shows, some land is not suitable for agriculture, and LandPKS can help provide knowledge to show this. Second, soil texture and AWC may influence decisions about crop selection or crop varieties. Planting crops that are suitable for their specific soil will help farmers increase production and farm more sustainably. For example, the farmer on the Upper Field may want to plant more drought resistant crops or practice water conservation measures in order to make up for the lower AWC of their farm. Location matters, and LandPKS is one tool that can provide point-based, geo-referenced data to those who need it to make more sustainable land management decisions. For more information about LandPKS please visit our website at landpotential.org or e-mail us at contact@landpotential.org.